When Dathan Ritzenhein was 11 years old his father got on a health kick and started running. 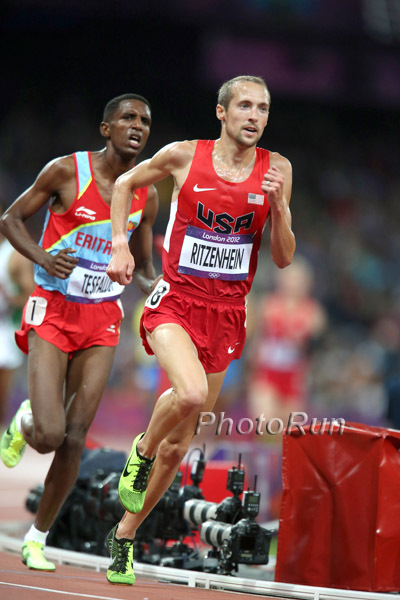 Mr. Ritzenhein had every intention of having his son tag along with him to stay active and participate in the local track club�s workouts and races. So when the club coach turned out to be the high school cross country coach it made sense for Dathan to join the team. Dathan took to the trails and track like a duck to water. In 7th grade he ran 11:58 for two miles then in 8th grade 10:24. Two short years later he won the national scholastic 2-mile title. That fall he won the Foot Locker National Cross Country Championship in course record time. After that he became almost a cult-figure amongst high school cross country and track fans. He won his second national scholastic 2-mile championship in 2000. At the same time in other parts of the country there were two high school standouts named Ryan Hall and Alan Webb. For the next 6 months the high school internet buzz was all about the eventual showdown between the three at Footlocker. Dathan didn�t disappoint. He won the race by 20 seconds staking claim as arguably the best high school distance runner ever. He capped off his senior season by winning his third national scholastic 2-mile championship (8:44.43) and running the 5000 in 13:44.70! It�s no surprise Dathan had multiple college offers to choose from. However he made only three college visits � Colorado, Michigan and Oregon. He chose to run for Mark Wetmore at Colorado because Wetmore�s program and coaching philosophy most closely mirrored his own. While at Colorado Dathan went on to become a 6-time All-American, NCAA cross country champion and set the American collegiate record in the 10,000. After college things got even better for the star known simply as �Ritz�. He placed 2nd at the 2008 U.S Olympic Trials in the marathon and finished 9th at the Olympic Games. In 2009 he had a phenomenal year. In Zurich he set a then American record in the 5,000 running 12:56.27. He became the first American to medal at the World Half-Marathon Championships placing third in a blistering 60:00 flat. He also placed 6th in the 10,000 at the IAAF World Championships running 27:22.28 � the fastest by an American in a championship race. In 2011 Dathan made a trip to Aim High. He spoke to the camp with a wound vac attached to his Achilles. It helped aid his recovery from two surgeries in which the sheath of his tendon was removed. There was scar tissue damage and his body was allergic to the stitches the surgeon used. He developed a post-surgical infection. He did everything with the wound vac attached to him including run. National running websites lifted pictures from the Aim High website showing Dathan running with it on. There was even talk of whether or not he would ever make it back to his national class running form let alone make his third Olympic team. After all, the Olympic marathon trials were only five short months away. However, Dathan couldn�t have been more positive and upbeat at Aim High. He ran the Olympic trials marathon setting a new personal best by 5-seconds but finished 4th not making the team. He changed his focus to the track. In June he placed 3rd in the 10,000 at the Olympic T&F Trials thus making his third Olympic team! A few months after the Olympics, Dathan became the 3rd fastest U.S. marathoner ever at the Chicago Marathon running 2:07:47. It�s a truly remarkable comeback. There are so many questions one can have for Dathan. What was it like being Dathan Ritzenhein in high school? What did he do when he was injured? What are his pre-race rituals? You can find all this out and more just by asking him�at Aim High! Dathan resides in hometown of Rockford, MI with his wife Kalin, daughter Addison (almost 9) and son Jude (6). Dathan has known his wife since 6th grade. An accomplished runner herself, Kalin was All-American while at Colorado too. Dathan is self-coached and helps coach collegiate and post-collegiate athletes at Grand Valley State University.